I was told when I was a child that a story had a 'beginning', 'middle' and 'end'. It meant nothing to me, I am a very visual person and words need fleshing out with images. A 'story mountain' does this for me. I am not sure where the idea comes from, yet I know it is used extensively in the UK by teachers for written work. For me it is a great tool for developing narrative. Story mountains are readily available on the internet for free, the TES have some great ones. Before I introduce this work I have worked extensively on sequencing, complex sentence coordination, mind maps and also vocabulary. This helps the child become prepared for more complex narrative work. It is not something I would introduce to the very young, but with adaptation it might be possible. The 'opening' is where you introduce the setting and the characters. The 'build up' describes further information about the characters, what they are thinking and also feeling. It also builds up to explaining the 'problem' in the story. The 'problem' discusses what the characters are confronted with, what they do, feel and think. The resolution is describing how the problem is sorted out- the character's actions. The ending is just that- is it happily ever after, are things really resolved? 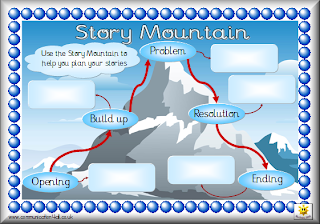 At each point of the story mountain we create a small mind map so that all the details can be included. The first time I introduce this idea I use a very simple picture book, which sticks to this story mountain format. We read through the book and then reread it picking out the points on the mountain. So the book might be something like 'The Three Little Pigs'. The opening being the mother sending them off; the build up is them choosing material and making their houses; the problem is the wolf coming, the resolution- them all being in the brick house and the wolf being 'got'; and the ending being the pigs having a party and being happy. Opening- There was a knight and a dragon who were friendly. They lived in a castle in the wood. Build up- One night when they had gone to sleep a mean wolf came to the castle, and decided he would live there. The Problem- The wolf wanted to scare the knight and dragon away from the castle and live there on his own. The knight and dragon were scared, and decided they needed to get rid of the wolf. Resolution- The dragon caught the wolf and flew him a long way away, the wolf was lost. The dragon came home. The dragon and knight were happy that the wolf was gone. Ending- The dragon and knight had a party with their friends in the castle. Once we have completed the story mountain, the story mountain is used to retell the story.